Lisa and I had read nothing but good things about the Twisted Root Burger Co., and being self-proclaimed burger connoisseurs, we were really excited to check it out. They've been nominated for best burger, best fries, best onion rings, and best restaurant value in Dallas, by several publications and websites. Unfortunately, on our visit, they didn't live up to the praise that they so often receive. First let me start by saying that I did like the atmosphere. Housed in an antique building in Deep Elum, just up Commerce from the old Copper Tank Brewery location, the interior has corrugated tin on the bar and walls, tabletops covered in bottle caps, humorous bumper stickers on the walls, hand-written chalkboard menus, and skylights, which gave the place a funky, comfy kind of feel. The staff was very friendly and accommodating and they have a full bar and a patio. Many of the menu items are made from scratch, on site, including ice cream, root beer (which had a definite sarsaparilla/licorice flavor), and pickles (we really enjoyed these). They tout their all-beef hot dogs and also serve some unique burgers such as buffalo ($7.99, always available), ostrich and venison (when in season), as well as turkey and veggie burgers. A couple of salad choices are available as well. You stand in line to order at the counter and are given a card with the "name" of your order printed on it. This is a little gimicky, but kind of fun, as the names on the cards are famous people, real and fictitious. We were Walker Texas Ranger; others were Bilbo Baggins, Violet Beauregard, and Clint Eastwood. The staff has a good time, throwing in a few ad libs, while calling these out and occasionally get a few laughs from some of the other diners. The Root is kid friendly and accepts most major credit cards. We were there at 1:00 pm on Saturday and by 1:15, the line was out the door, but they keep it moving pretty quickly. I ordered the cheddar burger ($5.49) with fries ($1.99) and Lisa had the peppercorn ranch and bacon burger ($6.99) with onion rings ($2.99). The burgers, served in red plastic baskets, had nice presentation, even though the order of non-crispy curly fries was pretty small for the price (I'm not a big fan of curly fries anyway). However, Lisa's onion rings were pretty darn good, for thick rings, as Lisa and I typically prefer thin. In fact, the crusty, golden, crunchy rings were sweet and flavorful. They will most likely make our upcoming "Best O-Rings in Dallas" list. There were a number of house made condiments, besides the basics, on the table, including a barbecue sauce, horseradish dijon mustard, and a chipotle ketchup. We found the mustard to be very good. The burgers are served on sesame seed buns, which were dry on top and a bit soggy on the bottom. The meat patties were 1/2" thick, cooked medium-well to well, which made them pretty dry. They also had no real noticeable seasoning. The bacon on Lisa's burger was crisp, but the peppercorn ranch was a little watery and made the rest of the burger moist. She wasn't able to finish hers, and she's a real hamburger nut. Overall, a fairly disappointing experience. With Adair's and Angry Dog right across the street, they've picked a tough neighborhood in which to sell a mediocre burger. The search continues. 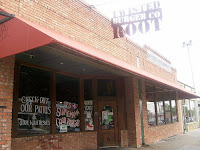 Twisted Root Burger Co. is located at 2615 Commerce St. Dallas, TX 75226. Phone: 214-741-ROOT (7668). Hours: M-W 11:00-2:30; Th-F 11:00-2:30 and 5:00-9:00; Sat 11:00-9:00; Sun 12:00-4:00.